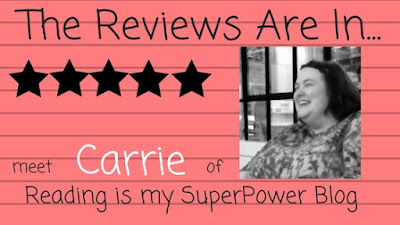 Meet Book Blogger Carrie of Reading is My SuperPower! Debra says: Hi Carrie! Thank you for visiting the Inkwell! I'm loving this new feature. D: What’s the best part of being a reviewer? C: Relationships! The friendships I’ve made as a direct result of reviewing books has been such a blessing. D: I absolutely agree (not that I review!) But I've loved the friendships with such warm, dedicated people! D: Be careful when you walk past, right? What was the last book you read that you couldn’t put down? D: I see that on a lot of lists and I'm pretty sure it just garnered an award! (with Awards season, I can't remember which one it was. Anyone??) I'm SO going to have to read this! What do you do when you aren’t using your superpower? C: I taught English as a Second/Other Language for 10 years with a local ministry, and my ‘real job’ is scoring the speaking portion of exams that internationals take to be admitted to university here in the states. I also love being the ‘cool aunt’ to our nieces and nephews and I have been known to break out a cross stitch project or two. But mostly I read lol. And review. And repeat. D: My younger son is an ESL or TESOL teacher, but he only has Hispanic and Latino students. Two languages (Spanish/English) instead of ten, right? What would you like to share about yourself that few people know? C: My first word was ‘book’ – which, in hindsight, is just about perfect! D: I'm afraid that might have been anyone's good guess! What is your favorite fictional setting? Place and time? Genre’? C: Oh goodness…. That’s like asking me to pick a favorite way to breathe. 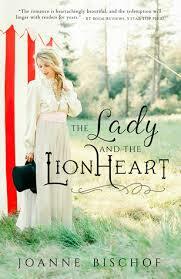 My fave genre is probably romantic suspense BUT I love Contemporary and Historical fiction just about as much. Favorite setting is historical Kentucky (because I moved here too late to take advantage of the required KY History class that all 4th graders take lol… so I learn a lot from those novels!) or Appalachia/Smoky Mountains. As far as time period? I love Civil War/Underground Railroad stories, WW2 fiction, Regency fiction, and Western expansion stories. D: I'm fascinated with the Underground Railroad because it's right here where I live (and so many others can say the same thing). It's on my list for subjects, but like your TBR pile, I'm afraid I have more ideas than I'll ever complete. What’s your favorite movie to watch if you had a rainy afternoon alone? And when that afternoon became a quiet evening, what could the caterers bring for your dinner? Money is no object! Dinner = It will be a hodge podge of foods I love but have to travel out of state to find. Like the apple cider donuts from Edwards Apple Orchard in Northern Illinois, the steak nachos (and an order of queso) from this Mexican place we go to a lot when we visit my brother & his family in Atlanta, the BBQ meal that I’ve been thinking about ever since I had it for dinner in Nashville after last year’s Christian Fiction Reader’s Retreat. D: I think that hodge-podge is perfectly acceptable. My friends and I recall trips we've taken by talking about specific restaurant meals! 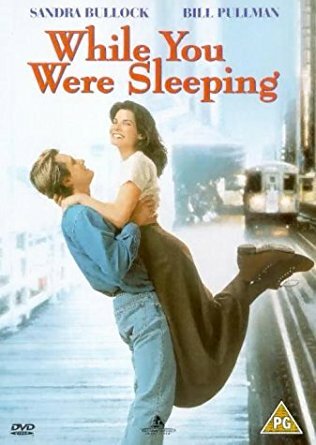 I like the vulnerability of these two characters in While You were Sleeping. I just watched it recently because I needed a break from historicals. C: Acquisitions editor. I would LOVE to be part of the team that acquires fiction for publishing houses. D: I will champion that for you and I think we could get a consensus! That's an incredible idea. Good for you! And, you've proved you've got the work ethic and experience to do it! C: Surround yourself with a community who will be your biggest champions but will also be honest enough to gently tell you if a chapter, a paragraph, a sentence just isn’t working. D: What advice would you like to give readers who’d like to write reviews? C: Start with your own collection, with books you’ve checked out from the library. Write reviews on Goodreads and/or Amazon. And study other reviewers – what do they say (and what they don’t), how do they frame positive reviews as well as negative, what are the terms they use, etc. But most of all? Be kind. Even when you don’t like a book, be polite and gracious. And now, something I'm really excited about because authors are readers and fans, too... Tell us about the Christian Fiction Reader’s Retreat! 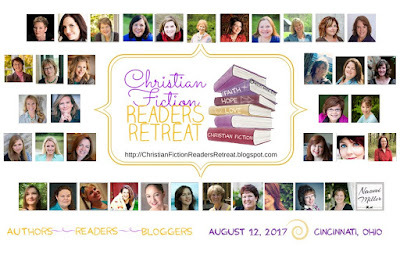 C: The Christian Fiction Readers Retreat is an event that Annie JC (from Just Commonly), Bonnie Roof, and I started in 2016. It’s a time for authors and readers to come together to honor God through our love for Christian fiction. We have keynote speakers, games, author panels, food, and great giveaways and swag! Last year, in Nashville, we had a blast!! And we are praying that this year in Cincinnati is even more fun. You can keep up with the goings-on at our website and Facebook. D: It's going to be amazing! I've met so many authors at ACFW conferences, but I love the idea of the CFRR because I get to be a fan girl (omigosh, I get to meet Laura Frantz?! 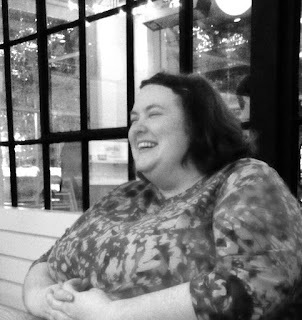 ), and I get to meet readers and reviewers and put faces with names of so many online friends! You all are so amazing to pull this together! YAY. It'll be here before we know it! C: Thank you again so much for having me, Debra! oops - here's another way to follow Carrie: Twitter! I really do love these reviewer interviews. You all have been so much fun and so interesting! (Of course! "readers lead a thousand lives" while those who don't have only one...) Thanks so much for coming by, Carrie. Your schedule astounds me and now you've got CFRR coming up in just barely a month! I look forward to meeting you and so many others in person! Carrie, you're a wonderful person to put so much effort into sharing our books. Meeting you and attending a CFRR is something I thought I could do this year, but it must stay on my bucket list for the time being. Even the ACFW is out for me due to family commitments and it's the first time I've missed ACFW since 2008 Minneapolis. - do you prefer to be on a launch team for a book, or a street team for an author? - do you prefer teams for novels only, or novella collections? - what do you expect in return for being on a team? Thanks for sharing Carrie with us today, Deb. Love the interview. Hi Anita!!! We will look for you next year at CFRR :) As far as street teams, can I say "yes" to all of the above? Lol! Most people on a launch/street team do expect a free book of some sort (digital is fine) but I think what we really love is interacting with the author. Getting sneak peeks at their upcoming covers, snippets of their new book as they are editing, brainstorming character/place names, etc. Yes to what Carrie said! Thanks Anita! I met many of these great reviewers when I was promoting Austen in Austin. At the time, I barely knew them. (some of them offered before I had to ask!) Now, a couple years later, I can see just how successful and professional they are. Well, professional is a strange term as it suggests payment--and in this case payment is free reading. Rumor has it CFRR is returning to Nashville and ACFW time next year, but I know it will continue to be a hot prospect. Authors grabbed spots within two days! It's an incredible opportunity. Me too. I'm 'sorta' glad to not be a featured author. This way I can just relax and enjoy CFRR by finally meeting my online friends in person! I'm so excited to see you both next month and hug your necks! You gave us a big start, Beth! I hate to brag, but I will. Interviewing book bloggers was a great idea. I'm loving this feature. It has made blogging fun again! This was a fun interview to read. 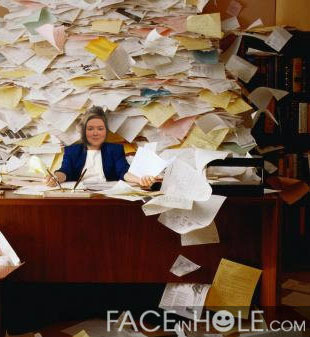 I don't know how Carrie does all that she does, I can barely keep up with her blog posts. I love her to pieces!!! I can't wait for CFRR this year! I can't believe it's only a few more weeks! I get to meet you to Debra! WooHoo! There is going to be a lot of squealing and hugging going on! I absolutely agree. I can barely do one post a week. Carrie is incredible! too true, Katie! Three years will fly by. My secret...as much as I love ACFW conferences, I'm more excited about CFRR! So fun to learn more about Carrie! She has been such a great encouragement to me and so many other authors. The first CFRR was amazing! I can't wait to see everyone in Cincinnati! Thanks Carrie! See you in a few weeks! What a great interview, spotlighting a major champion in the world of Christian Fiction! And I too, am looking forward to seeing her again at the CFRR! Thank you, sweet friend! Can't wait to see you again!! Yes, and there will be many others watching you now... Carrie, have you considered a security guard? ha ha. I absolutely loved this interview! Great questions and I interesting answers. :) I am planning to attend ACFW 2018 AND I would love to attend CFRR someday. Is ACFW 2018 in Aug or Sept? I think it's in Nashville but I never bothered to look at the dates! September, I believe! We'd love to have you there next year, Kathleen! Oh what a fun interview, Debra! Carrie, you would be a great acquisitions editor! Hope to meet you in person next year! Thanks for stopping in and leaving a comment, Janet. (and for the encouragement. I'm glad you enjoyed the interview!) I thought I'd change the questions for each person but they've brought such interesting answers, I've stuck with the same ones. Thank you, sweet Janet!! NEXT YEAR!! And Debra - I loved these questions! This is sooooo FUN!!! What a fantastic idea to spotlight bloggers! :D And it is great to learn more about Carrie!! Hi Sydney! I have a list of people I'm hoping to host, and I highlight them on my own personal blog as well (and on pinterest). So far it's been a blast and my plan is this feature encourages more readers to do active reviewing. Thanks for stopping in! Thanks for commenting, Jen! I'm really looking forward to meeting Carrie in person! Great interview, Carrie and Debra. I know we get to know reviewers partly through the books they (we?) read and review, but it's also great to learn a little more about my fellow bloggers. Hi Iola! You have great insight into both sides of reviewing. I'm better at 20k words, than 500. I definitely am in awe of reviewers! I am super late to the party, but I had to say hi! Great interview. Carrie is a sweetheart and I love her reviews. Waving hi to you both! Better late than never, right? Thanks Susie! I wish we could transport you to Cincy next month! Seriously! (about the editor part, not the late part!) After reading so many books, I'm sure Carrie has the touch! Carrie is pretty amazing. She answered a zillion questions and more when I was getting my book blog restarted, and always found a second to answer then when I thought of ten more. She is a gem!